Many of us look in our closets and feel that there is not enough variety, that we are wearing the same thing over and over. We conclude that we need a whole new wardrobe. Not true. Accessories are a great way to change the look and feel of your current wardrobe. And they don’t need to be expensive. 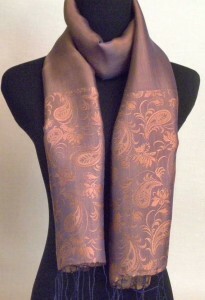 Silk scarves can change the look and feel of many elements of your wardrobe. A simple white tee shirt and jeans can look very fashionable with the addition of a silk or raw silk scarf. Silk scarves can be worn with button down shirts, either draped down the front or tied at the neck. A pattern scarf can pull together a shirt and pants or skirt to achieve a coordinated look. 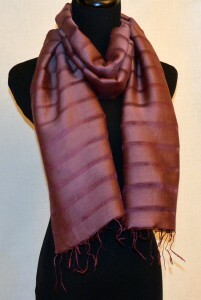 Silk scarves truly are very versatile addition to your wardrobe. They last for years and really don’t go out of style. When we evaluate our wardrobe, it is often not necessary to replace, rather to enhance. We need to think about what we want to achieve. Looking for a more hip look or fun look? 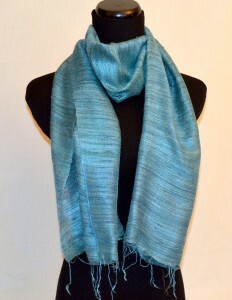 Raw silk scarves can lend a contemporary feel to your wardrobe and outfits. Trying to add sophistication to your repertoire? Satin silk scarves add elegance and refinement. Seeking that go to accessory that you can reach for in a pinch? 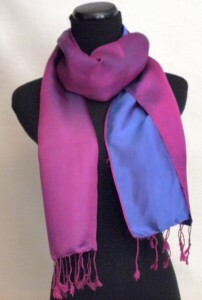 A long scarf can be worn as a shawl of wrapped around the neck. There are infinite ways to enhance your wardrobe with silk scarves. All it takes is your imagination.